The biggest differences between the right and left handed guitar situation is to do with the actual construction and set-up of the instruments. There are ways to get around these differences but not in every case will it be possible or practical to do it. Much depends on the type of guitar. The four biggest issues centre on string length, the arrangement of string tension, the quality of frequency response and ergonomics. 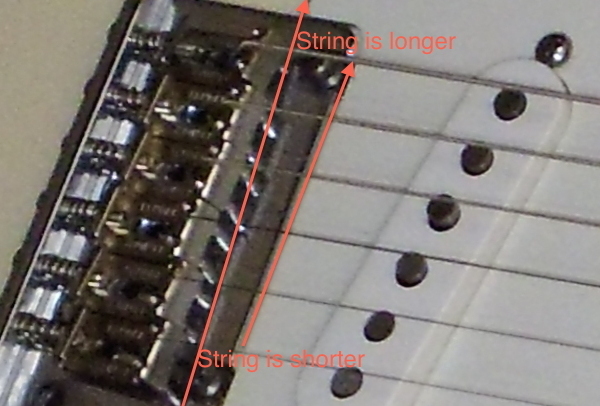 The first concern comes with what is called “compensation” of string “scale length” to create accurate “intonation”. In a nutshell this means usually that bass (the fatter strings) need to be longer than the treble (thinner ones). (See the photo below also found on the guitar sizes page) This is done to make the guitar play in tune with itself across the entire range of the neck. Generally speaking this is a compensation for strings of different gauges (of varying diameters) being stretched slightly over the frets (of varying heights from guitar to guitar) by the (varying) finger pressure when playing. This has the effect of making the notes sound higher in pitch (sharp). The sharper the pitch the longer the string needs to be to offset this distortion of pitch. Many acoustic guitars have bridges with fixed permanent angles of compensation. This can make it very difficult or expensive to convert into a left handed guitar. By simply turning a guitar “upside down” and re-stringing it “lefty” you are creating a compound error in the string length compensation. The guitar will never be in tune in both the lower registers and the upper registers. You may get away with that if you only want to play music within a range of a few frets and always in whatever place that you tuned it to behave in! Very limiting indeed. Have a look at this section of the website explaining scale length and intonation. Another consideration is string tension. Guitars are built to accept the difference in tension between the bass side of the fingerboard (toward the ceiling with greater pounds per sq. inch) and the treble side (toward the floor with lesser pounds per sq. inch). This is referring to a guitar when held in a right hand playing position assuming a right handed guitar. This is more of a concern with acoustic (hollow) guitars because of the more delicate nature of the body carcass and how it responds and vibrates through the internal bracing along with other factors. The bracing varies from maker to maker. In the case of most reasonable quality guitars the bracing is designed to get the most out of the resonating qualities of the type of wood and specific size and design of the instrument. The belly, front or top also even called the plate sometimes, is a very important consideration. The top along with the guitars ribs (sides) and back can be as thin as 2 to 3 millimeters in some cases. Again simply re-stringing "upside down" can create unwanted side effects. Ok well my most wanted response may be you doing something to support this site but… What we are talking about here is the frequency response and tone of your guitar. As we see from above the tension arrangement of the strings has to be considered. What also has to be considered is the resonant quality of the whole instrument and the makers attempt at constructing (consistently) instruments with a high quality pleasing tone. Everything from the humidity to the type, weight and form of the wood, glue, hardware etc…demands great attention. So yep you probably guessed it … turning a left handed guitar upside down and re-stringing it? Maybe not a good idea! Finally there is the ergonomic aspect of the guitar itself. When you take a guitar designed for right or left handed guitar playing and play it the opposite way to its intended design you are, yes I know, again in effect turning it upside down. A “cutaway” body shape designed to let you reach higher notes on the fret board becomes useless. Electronic controls are in hard to reach places. Hardware and parts need to be altered or replaced in order to function. Sometimes like in the case of the great genius Jimi Hendrix some of these things can work to our advantage. Most of the time it can be time consuming and expensive to sort out. You may have put it together that the acoustic guitar construction quite often presents more difficulties when trying to just convert to the opposite hand. You would have to look at things on a case by case basis. If you can successfully convert a "righty" to left handed with out permanent "damage" you could return it to right handed for re-sale. That may be one of the considerations about deciding to play left handed. What are the extra costs and restrictions? I hope this helps in some way. Please feel free to share this information freely. All I ask is that you mention PlayableGuitar.com if you do. Your support to help keep this site growing is much appreciated. As always Happy Playing!